These natural and DIY pesticides are effective at helping to rid your crops of harmful critters, but safe enough to keep from poisoning you and your family. 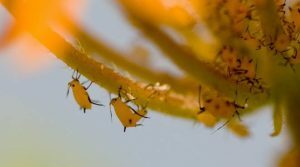 When it comes to keeping your crops healthy in the face of massive quantities of plant-munching bugs insects, there are a number of approaches that can help turn the tide in favor of your own harvests, and while removing insects by hand is one time-tested method, it can also be incredibly challenging to do so, or can be too little too late. Another, far less time-intensive method of knocking back insect populations is by applying natural or homemade insecticides, which can reduce their numbers or eliminate them all together. Not all bugs insects are harmful, so applying insecticides indiscriminately, especially harsh pesticides that affect even the beneficial insects, can have a detrimental effect on your local garden ecosystem.